The Weihrauch HW97K has been specifically designed for field target shooting and provides shooters with an extremely accurate spring air rifle from one of the most prestigious names in the business. The HW97K features a carbine length stock that is light and manoeuvrable but doesn't sacrifice any degree of strength. 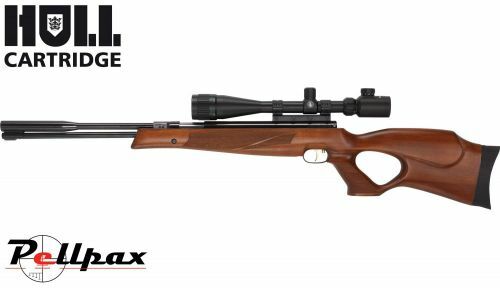 The air rifle also features a fixed barrel system that is fitted with a muzzle break for minimal recoil and improved accuracy. The elegantly designed stock is designed specifically to be used with a scope and features chequered fore end pistol grip. The stock also comes fitted with a thick rubber recoil pad to minimise shoulder fatigue and keep you on target for longer.